And just as in Nash’s beautiful paintings, our own windows act like a frame on what is (hopefully) a beautiful scene in our own gardens. 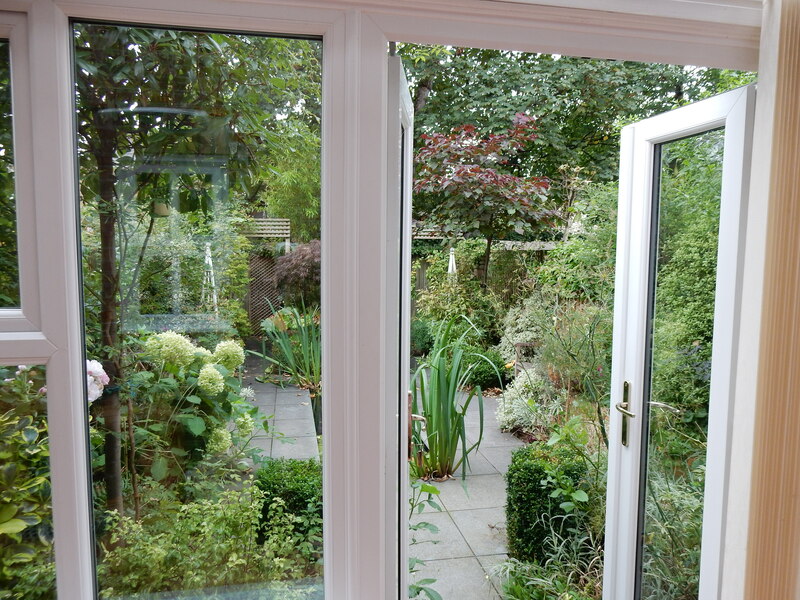 When we first bought our house it was a complete wreck, but the one good thing was that I could see right through from the front door to the back window and a glimpse of the garden beyond. It’s something I’ve enhanced as I do feel that there should be a sense of anticipation as you walk towards a window- what sort of beautiful scene will be revealed? I like to sit here to eat breakfast and look out at a detailed scene full of seasonal planting and interesting artifacts- it’s a picture that I never tire of. Here’s my desk overlooking the table on which I keep an ever-changing display of pots, including my latest ‘finds’ from plant nurseries , there to be enjoyed for a while before being used in clients’ gardens. In fact framing views has always been important. The resourceful Victorians used Claude glasses ( convex black mirrors)as a frame for drawing sketches of picturesque landscapes. The user would turn his back on the scene to observe the framed view through the tinted mirror—in a sort of pre-photographic lens—which added the picturesque aesthetic of a subtle gradation of tones. A perfect view already framed. And here’s a tip if you ever want to get a fresh perspective on your own garden. Go outside with a hand mirror and look at it reflected back at you- you’ll be amazed. All of a sudden you can see it completely fresh as others see it for the first time, warts and all. Go on, try it! But don’t break your neck doing it now will you? Here’s a changed view from a window- better, eh? So, do what I do and ask yourself, “Do my windows frame a beautiful garden scene?” and if not, do something about it. After all , it’s your most important view on the world outside. What an artful frame you have to the gardens! What creative vision! I specially loved the Water Lilly turf so strategically placed under the window . Yes, i agree when you say it is the most important frame through which we gaze at the world. I believe the garden is the soul of the house. Countless precious memories are formed in the morning sun or a silver moonlight streaming into the garden. Though i am an amateur green finger, i passionately design the gardens of houses i move into (Army spouse). Spectacular! !…I have just reblogged this blog. Thank you for the inspirations! We just bought a new house and the backyard is currently a blank slate… I love your garden, especially the use of the table outside the window with pots to seasonally change up the view! That would work great outside our breakfast nook window, which I was trying to figure out how to landscape but didn’t want to end up blocking the natural light when whatever we planted grew up. I really like your garden. It’s beautiful. And ya your windows truly frame beautiful garden!!! The fruity gardener is so inspiring!…….love her.